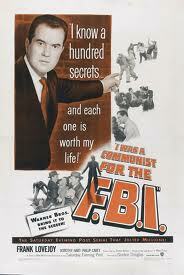 I Was a Communist for the FBI –Here is a link to a film clip from the 1951 film I Was a Communist for the FBI. Any first hand account of J. Edgar Hoover would be flawed if it did not convey his obsession with the public’s opinion of himself and the FBI. This included pop culture. Many great books have been written about the FBI’s changing place within popular culture and media including, G-Men: Hoover’s FBI in American Popular Culture by Richard Powers, and The FBI and the Movies by Bob Herzberg. One of the more interesting occurrences in which the FBI’s clandestine operations melded with popular culture was the popularity of I Was a Communist for the FBI, which started as a serial story in the Saturday Evening Post. 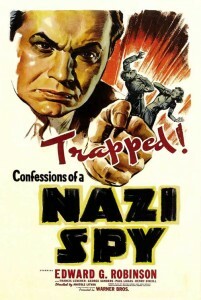 Both a film and a weekly radio drama of the same name soon followed. The fictionalized film, staring Frank Lovejoy, would even earn an Academy Award nomination for best documentary. Matt Cvetic was a professional informant for the FBI for nine years. considered Cvetic an extremely useful informant for much of his tenure with the Bureau. 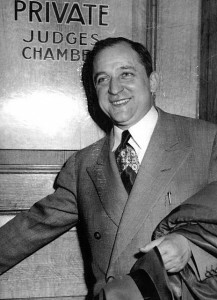 Various Special-Agents-in-Charge of the Bureau’s Pittsburgh office reported to Hoover on Cvetic’s “excellent results.” However, according to Cvetic, the job was starting to become to much for him. Cvetic claimed in front of the HUAC that his family had begun to shun him because of his affiliation with the Communist Party. He also claimed to be under physiological and spiritual distress because his cover as a Communist had prohibited him from attending church lest he be exposed as a man a faith. For whatever reason, the stressful job seemed to be taking its toll on an already unstable man. From many accounts I’ve read about Cvetic, most accuse him of being an abusive father and husband as well as a raging alcoholic. The whole story of Matt Cvetic and I Was a Communist for the FBI shows the public fascination with FBI covert actions and the counter-communist initiatives of the U.S. government. It is also indicative of something I have discussed many times on this blog, that being the potency of the public paranoia that the FBI and its affiliates cultivated throughout the 1940s, 50s, and 60s. Daniel J Leab, “Anti-Communist, the FBI, and Matt Cvetic: The Ups and Downs of a Professional Informer.” The Pennsylvania Magazine of History and Biography. Vol. 115, No. 4. (Oct., 1991) Pp. 542. What was the Smith Act? Starting with its passing in 1940, the Smith Act became one of the most effective weapons in the government’s arsenal during its domestic war on communism. Proposed by conservative representative Howard Smith of Virginia and signed into law by Franklin Roosevelt, the act made illegal any act of advocacy, public or private, on behalf of overthrowing the government. This was a major blow to the Communist Party as it effectively made being a member illegal because of the Communist Manifesto’s emphasis on an eventual violent overthrow of modern capitalist regimes. 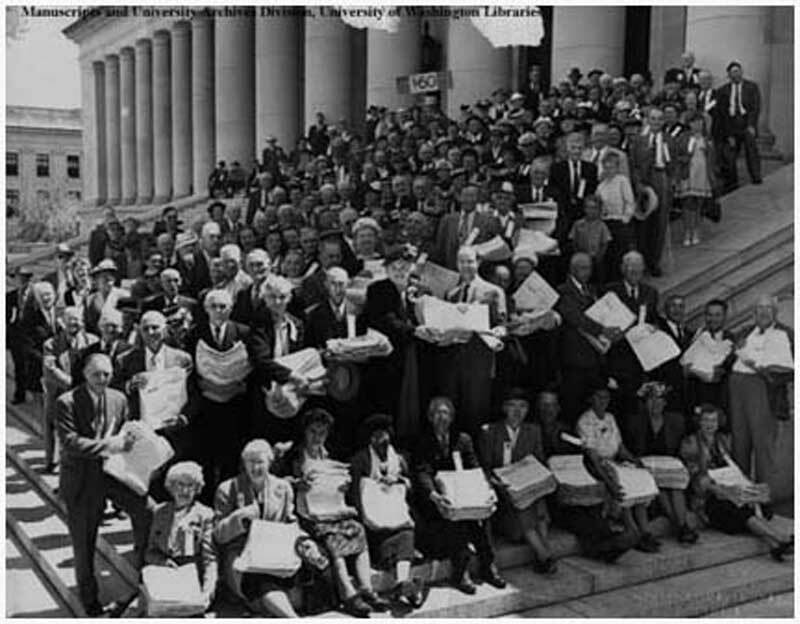 Here activists bring petitions to the Supreme Court in support of the 11 defendants of the "Smith Act Trial"
would become infamously know as the “Smith Act Trial.” The government’s case: the men and women on trial subscribe to communist ideology, one of whose tenets clearly advocates for a violent overthrow of the government. Therefore the defendants are guilty of conspiracy under the Smith Act. 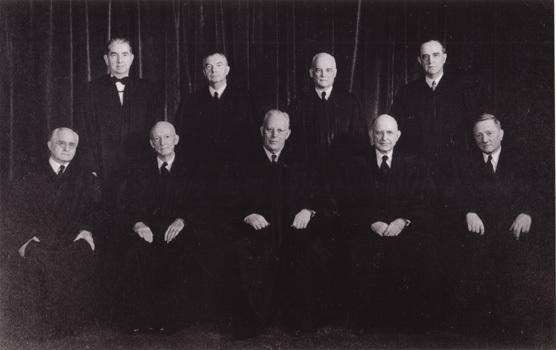 This is a picture of the Supreme Court as it existed during the Smith Act Trial. First row, second from the left is Justice Hugo Black who disagreed with the 6 to 2 majority. As used in this section, the terms “organizes” and “organize”, with respect to any society, group, or assembly of persons, include the recruiting of new members, the forming of new units, and the regrouping or expansion of existing clubs, classes, and other units of such society, group, or assembly of persons. Eugene Dennis, “Opening Statement of Behalf of the Communist Party.” March 21, 1949, From, Ellen Schrecker, editor. The Age of McCarthyism: A Brief History with Documents. New York: Bedford, 2002. Pp. 200. Justice Hugo Black, “Dissenting Opinion in Dennis et al. v. United States.” June 4, 1951. From, Ibid. For me, some of the most interesting stories involving the FBI in this period come from their attempts at disinformation or counter-intelligence. One example of this is the infamous story of William Albertson. William Albertson joined the Communist Party while he was still at the University of Pittsburgh in 1929. He was a dedicated member of the party both in Pennsylvania and later in New York City where he moved after being expelled from college for organizing rallies. Over the years he worked his way up to being one of the highest raking members of the party and serving as the secretary of the Communist Party for the state of New York. That is, until July of 1964. 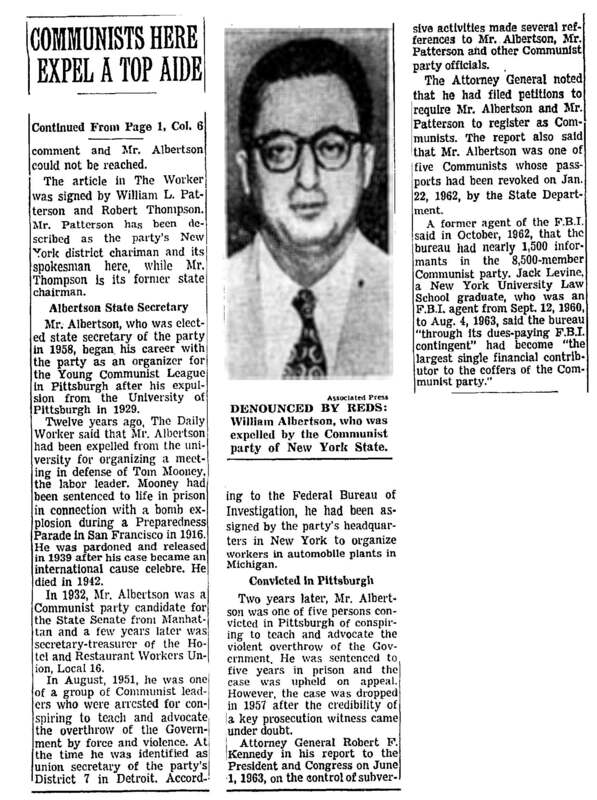 July 8, 1964: The New York Times reports that 54-year-old William Albertson is expelled by the Communist Party for being a suspected government informant. to the authorities. Needless to say, the documents were found and Albertson was ousted from the Communist Party and exiled from the community he had been linked to for almost 40 years. The New York Times reported that, “The date of the expulsion was not given nor was the police agency that Mr. Albertson allegedly served identified. Party officials declined to make any comment and Mr. Albertson could not be reached.” Albertson died sometime later in a car accident. He had never stopped trying to assert his innocence to the party but his attempts were futile. Many more contemporary writers and historians have looked at the interesting case of William Albertson as a sort of litmus paper for how effective the FBI had become at intimidating the party by reputation alone. David Garrow writes, “Widespread suspicion of informant penetration provided fertile ground for accusations of betrayal whenever movement tensions led to angry, personal recriminations. The CP’s knee-jerk acceptance of William Albertson’s snitch-jacketing is the worst but by no means the only example of how ready thousands of activists within a wide-ranging assortment of FBI target groups—the CP, the Black Panthers, SCLC, and the Ku Klux Klan—were to uncover real or imagined informants within their ranks.” The Albertson case is a great demonstration of how effective the FBI had become in infiltrating not only the organizations of leftists, but also their imaginations. You can read more about this in my post on this topic. Curt Gentry, J. Edgar Hoover: The Man and the Secrets. New York: W.W. Norton and Company, 2001. Pp. 444. Murray Illson, “High-Ranking Communist Here Ousted by Party as ‘Police Agent,’” New York Times. July 8, 1964. Anthony Lewis, “A Cointel Story.” New York Times. May 29, 1976.
Who “Green Lighted” Modern Surveillance and why? 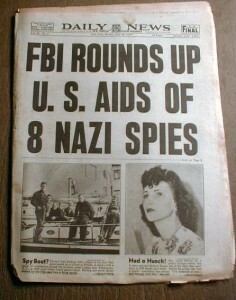 In 1942, the FBI discovery of 8 Nazi Spies in the U.S. helped to add to FDR's paranoia. “A free people must have both security and liberty. They are warring forces, yet we cannot have one without the other.” -Tim Weiner. Enemies, xv. I want to start by asking you a question. Was Surveillance right? Is it morally justified? Many people will tell you it was unconstitutional and evil, others will say it was a necessity against the communist threat in America. Historians and authors have argued over this issue from both sides of the proverbial aisle for decades. The answer probably lies, like in most issues, somewhere in the middle. For now though, it’s useful to go off the premise that there is just no right answer. I find it more productive to ask questions whose answers can be found in historical evidence. For example, the question that titles this post. 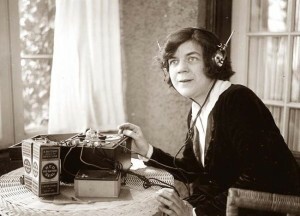 It turns the political issue on its head for instance, to know that one of the most progressive figures of the 20th century was the person who first gave director of the FBI, J. Edgar Hoover, the go a head on technically illegal and unconstitutional wiretaps as well as other systems of surveillance. That progressive man was Franklin Delano Roosevelt, and the reason why he thought intelligence so necessary is rooted in the fear of the Soviet and Nazi spies that lurked within the United States. These spies and saboteurs were very real and very well documented. Journalist Tim Weiner’s new book Enemies: A History of the FBI is the first book of its kind and gives a detailed and concise narrative of the FBI as an intelligence and surveillance organization rather than a crime fighting institution. Weiner chronicles the serious backlash that occurred after the 1920s when Hoover’s overzealous and shockingly illegal attempts to prove a conspiratorial link between American Communists and the Soviet Union backfired. After this period, often called the First Red Scare, the power of the FBI was drastically rained in by the legislative and judicial branches of the government. Just as the FBI’s espionage operations seemed to have been overtaken by the more constitutional crime fighting wing, the new president Franklin Delano Roosevelt stepped in to re-grant the FBI secret powers that would have made the fledgling ACLU cringe. FDR, afraid of America’s lack of intelligence organizations and scared of Nazi spies and saboteurs on American soil, began funneling money under the table and without the approval of Congress straight to the FBI. In 1938 the FBI had only 587 full time employees and wiretapping, mail opening, and bugging, were still declared unconstitutional and illegal. By mid 1940 however, in the name of national security and with direct permission from President Roosevelt, the FBI had all but doubled its amount of agents, as well as planted almost 7,000 wire taps and nearly 2,000 bugs without warrants. Memorandums from FDR to his Attorney General Robert Jackson authorizing wiretapping of “suspected subversives” are well documented and often turn up in Government investigations as a root of unconstitutional behavior in the FBI. These actions were justified by the necessity of surveillance and intelligence during a time of world conflict in order to maintain national security. It was this precedent (aided by Hoover’s public relation campaigns to expose the domestic communist threat in the post-war period), that kept America in a perpetual state of extenuating circumstances. Tim Weiner, Enemies: A History of the FBI. New York: Random House, 2012. Pp. 59. Committee, Intelligence Activities and the Rights of Americans: 1976 US Senate Report on Illegal Wiretaps and Domestic Spying by the FBI, CIA, and NSA. St. Petersburg: Red and Black Publishers, 2007. Pp. 26.